This is a commission for a friend, whose coworker has just had a baby girl. TRON is more important to this coworker than I am allowed to explain here. Ha. That sounded dirty (it truly isn't). The bib pattern is from The Purl Bee. It was exciting to be able to craft for a baby. I always see great crafts for babies, but alas, there are no babies in my life. Which is probably a good thing, but still... cute bibs, man. 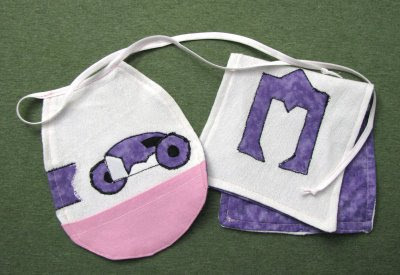 The applique on the bib is a Light Cycle, and the applique on the burp rag is a Recognizer. Does it look like an M? I should have planned that one out a little better. Maybe if I am lucky, M is also important to this coworker. I don't really get the tron thing, but they are cute anyhow.